In January 2016, I needed to assemble a full band for the release of my Fifty Clementines. I already had the pieces in place and just needed to put them together. So, combining the MCTrio, Rusty Speidel & Thomas Gunn, with the house band I’d been playing with on Monday Nights at The Local, Matty Metcalfe & Paul Rosner, proved to be a wonderful sum. The success of that release weekend paved the way for future performances like Fridays After Five, The Batesville Market & Jammin Java in Vienna VA. While not the most actively touring act, the quintet always manages to deliver a fun, high-energy, sonically-pleasing set with minimal carnage. 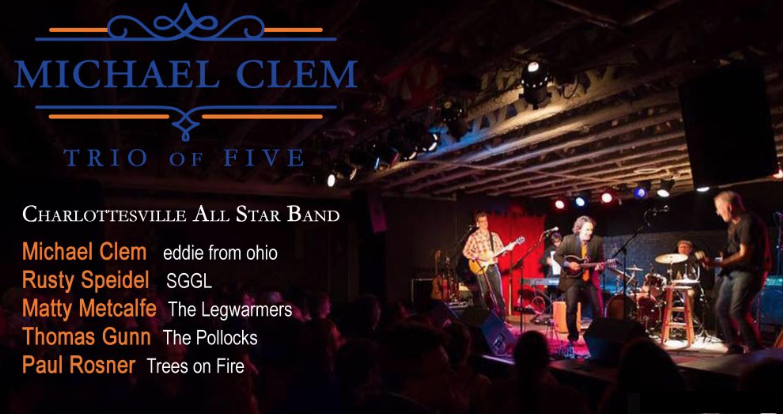 The songs, in addition to quirky Clem originals, include thoughtful off the beaten path covers & road tested nuggets from the Americana and Classic Roots Rock catalogue.